The existence of thousands of job openings at Amazon testifies to how rapidly the company is growing and why its impact on the Seattle area is a source of cheer and concern. Think there are too many Amazonians in Seattle? Washington’s Employment Security Department says that between May and August, Amazon.com posted 11,042 job openings online in King County, double the number from the same period last year. The runner-up was the University of Washington, with 2,757. Microsoft had 1,611. The numbers mean that the tech and retail giant’s Pantagruelian appetite for workers dwarfs that of every other employer in Seattle’s red-hot market for tech skills. At the end of the second quarter, Amazon had 268,900 employees worldwide, a 47 percent jump from the previous year, putting it on track to surpass every other Fortune 500 company except Wal-Mart in a couple of years. Most of the job growth is in lower-paying fields such as warehouse operations. But the local online job postings show that there are plenty of high-paying new jobs at its Seattle headquarters, too. To be sure, every job opening doesn’t necessarily mean one extra person commuting to South Lake Union. The number of postings includes many jobs left open by Amazonians moving on to new pastures. But of the 8,000 or so jobs currently open in Seattle, about two-thirds are newly created positions. It’s a good example of the transformative impact of Amazon in the Puget Sound region, where median salaries are being pushed up by frenzied demand for tech talent. “I’ve been in this market for 17 years and I’ve never seen anything like this,” said Megan Slabisnki, district president in Seattle of Robert Half Technology, a unit of a global human-resources firm that does staffing and recruiting. Slabinski said the candidate shortage in Seattle parallels that of the San Francisco Bay Area, and is among the highest worldwide. In such an environment, a large employer like Amazon “is going to have a ripple effect,” she said. Recent census data showed that median household incomes in Seattle topped $80,000, a nearly $10,000 jump in one year, the biggest leap among the largest U.S. cities. Burning Glass Technologies, a recruiting consultancy, says that of the nearly 63,000 jobs open in the Seattle metro area during the past 60 days, about a fifth are in the professional-services and information fields, areas in which Amazon is a top recruiter. Amazon’s impact goes well beyond the tech-job market. Amazon, with more than 25,000 local workers, is still far from being the largest employer in the area. Boeing employs some 75,000 people in the Puget Sound region. Microsoft employs about 44,000 here. But a look at the cranes around downtown Seattle will show you that Amazon is indeed growing rapidly. Once all those buildings are done by the end of the decade, there will be room for a total of 55,000 people. Amazon is also making some moves that show its long-term thinking about talent acquisition. The company on Thursday announced a $10 million donation toward the building of a new computer-science building at the University of Washington, a structure expected to help double the enrollment of UW computer science graduates. David Zapolsky, Amazon’s general counsel, told reporters that the donation was geared to helping relieve a bottleneck in the availability of talent flooding into the field. Also, the company has lined up enough office space in Bellevue to accommodate some 2,000 employees, a location that could give it access to Eastsiders reluctant to deal with bridge traffic. Meanwhile, as of Wednesday morning, there were 8,343 Seattle job openings listed on Amazon’s site. That’s not even the highest on record. In June, the company was looking for 10,100 new recruits, according to the Employment Security Department’s numbers. That month the department recorded 75,374 online postings in the entire state of Washington. 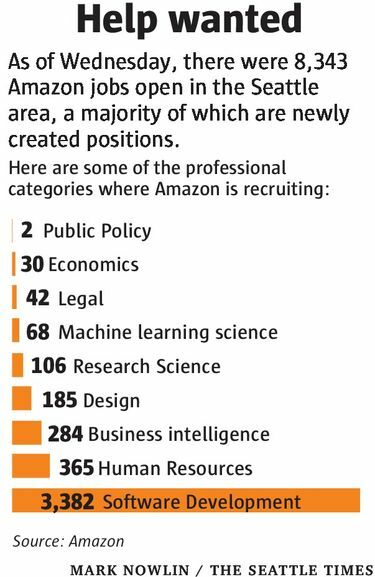 Amazon was also looking for 31 economists and 3,336 software developers. To serve this ballooning army, which grows larger by the week, the company also needs 363 human-resources specialists, including dozens of recruiters. There’s the question of who gets to fill those jobs: newcomers adding to the city’s growth or those already in the local workforce. But, he added, the city acknowledges that “some people need help to prepare themselves for these opportunities,” and that’s why it’s part of a White House initiative known as TechHire, which trains and places people in tech jobs, and in which Amazon also participates. In 2016, TechHire is expected to train and place 350 people, a number expected to grow to 2,000 people by 2020. That’s probably not enough to satisfy Amazon’s appetite. But it brings to light other advantages of having Amazon as a hometown giant: Its high salaries, cool factor and relocation packages help draw talent from other parts of the country that other companies here can later poach from. 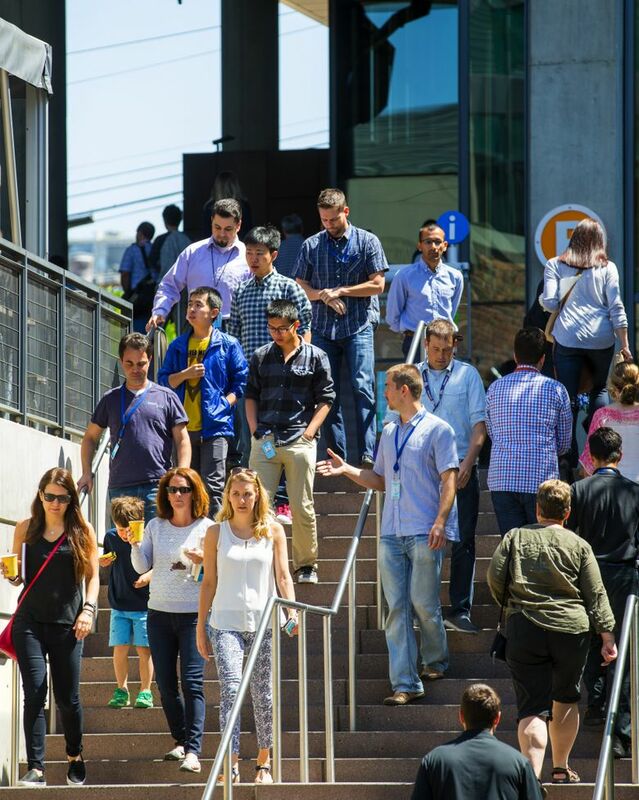 That growing pool has attracted San Francisco Bay Area behemoths such as Google and Facebook to step up their presence in the region. Ángel González: 206-464-2250 or agonzalez@seattletimes.com. On Twitter @gonzalezseattle. Seattle Times technology reporter Matt Day contributed to this story.